This article is about the official language of Indonesia. For an overview on all languages used in Indonesia, see Languages of Indonesia. This article contains IPA phonetic symbols. Without proper rendering support, you may see question marks, boxes, or other symbols instead of Unicode characters. For a guide to IPA symbols, see Help:IPA. Indonesian (bahasa Indonesia [baˈhasa indoˈnesia]) is the official language of Indonesia. It is a standardized register of Malay, an Austronesian language that has been used as a lingua franca in the multilingual Indonesian archipelago for centuries. Indonesia is the fourth most populous nation in the world. Of its large population, the majority speak Indonesian, making it one of the most widely spoken languages in the world. Most Indonesians, aside from speaking the national language, are fluent in at least one of the more than 700 indigenous local languages; examples include Javanese, Sundanese and Balinese, which are commonly used at home and within the local community. However, most formal education, and nearly all national mass media, governance, administration, judiciary, and other forms of communication, are conducted in Indonesian. The Indonesian name for the language (bahasa Indonesia) is also occasionally found in English and other languages. Rencong alphabet, native writing systems found in central and South Sumatra and Malay Peninsula. The text reads (Voorhoeve's spelling): "haku manangis ma / njaru ka'u ka'u di / saru tijada da / tang [hitu hadik sa]", which is translated by Voorhoeve as: "I am weeping, calling you; though called, you do not come" (in modern Malay "Aku menangis, menyerukan engkau, kaudiseru, tiada datang [itu adik satu]"). 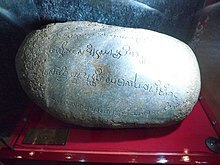 Kedukan Bukit Inscription, written in Pallava script, is the oldest surviving specimen of the Old Malay language in South Sumatra, Indonesia. Indonesian is a standardized register of "Riau Malay", which despite its common name is not the Malay dialect native to the Riau Islands, but rather the Classical Malay of the Malaccan royal courts. Originally spoken in Northeast Sumatera, Malay has been used as a lingua franca in the Indonesian archipelago for half a millennium. It might be attributed to its ancestor, the Old Malay language (which can be traced back to the 7th century). The Kedukan Bukit Inscription is the oldest surviving specimen of Old Malay, the language used by Srivijayan empire. Since the 7th century, the Old Malay language has been used in Nusantara (Indonesian archipelago), evidenced by Srivijaya inscriptions and by other inscriptions from coastal areas of the archipelago, such as those discovered in Java. Trade contacts carried on by various ethnic peoples at the time were the main vehicle for spreading the Old Malay language, which was the main communications medium among the traders. Ultimately, the Old Malay language became a lingua franca and was spoken widely by most people in the archipelago. Indonesian (in its normative form) has essentially the same material basis as the standard Malaysian register of Malay, and is therefore considered to be a variety of the pluricentric Malay language. However, it does differ from Malaysian Malay in several respects, with differences in pronunciation and vocabulary. These differences are due mainly to the Dutch and Javanese influences on Indonesian. Indonesian was also influenced by the Melayu pasar (literally "market Malay"), which was the lingua franca of the archipelago in colonial times, and thus indirectly by other spoken languages of the islands. Malaysian Malay claims to be closer to the classical Malay of earlier centuries, even though modern Malaysian has been heavily influenced, in lexicon as well as in syntax, by English. The question of whether High Malay (Court Malay) or Low Malay (Bazaar Malay) was the true parent of the Indonesian language is still in debate. 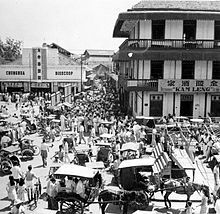 High Malay was the official language used in the court of the Johor Sultanate and continued by the Dutch-administered territory of Riau-Lingga, while Low Malay was commonly used in marketplaces and ports of the archipelago. Some linguists have argued that it was the more common Low Malay that formed the base of the Indonesian language. When the Dutch East India Company (VOC) first arrived in the archipelago, the Malay language was a significant trading and political language due to the influence of Malaccan Sultanate and later the Portuguese. However, the language had never been dominant among the population of the Indonesian archipelago as it was limited to mercantile activity. The VOC adopted the Malay language as the administrative language of their trading outpost in the east. Following the bankruptcy of the VOC, the Batavian Republic took control of the colony in 1799 and it was only then that education in and promotion of Dutch began in the colony. Even then, Dutch administrators were remarkably reluctant to promote the use of Dutch compared to other colonial regimes. Dutch thus remained the language of a small elite: in 1940, only 2% of the total population could speak Dutch. Nevertheless, it did have a significant influence on the development of Malay in the colony: during the era of colonization the language that would be standardized as Indonesian absorbed a large amount of Dutch vocabulary in the form of loanwords. 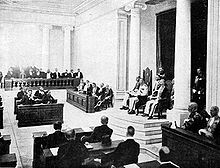 Volksraad session held in July 1938 in Jakarta, where Indonesian was formally used for the first time by Jahja Datoek Kajo. The nationalist movement that ultimately brought Indonesian to its national language status rejected Dutch from the outset. However, the rapid disappearance of Dutch was a very unusual case compared with other colonized countries, where the colonial language generally has continued to function as the language of politics, bureaucracy, education, technology, and other important areas for a significant time after independence. Soenjono Dardjowidjojo even goes so far as to say that "Indonesian is perhaps the only language that has achieved the status of a national language in its true sense" since it truly dominates in all spheres of Indonesian society. The ease with which Indonesia eliminated the language of its former colonial power can perhaps be explained as much by Dutch policy as by Indonesian nationalism, though. In marked contrast to the French, Spanish and Portuguese, who pursued an assimilation colonial policy, or even the British, the Dutch did not attempt to spread their language among the indigenous population. In fact, they consciously prevented the language from being spread by refusing to provide education, especially in Dutch, to the native Indonesians so they would not come to see themselves as equals. Moreover, the Dutch wished to prevent the Indonesians from elevating their perceived social status by taking on elements of Dutch culture. Thus, until the 1930s, they maintained a minimalist regime and allowed Malay to spread quickly throughout the archipelago. Dutch dominance at that time covered nearly all aspects, with official forums requiring the use of Dutch, although since the Youth Congress (1928) the use of Indonesian as the national language was agreed on as one of the tools in the pro-independence struggle. As of it, Mohammad Hoesni Thamrin inveighed actions underestimating Indonesian. After some criticism and protests, the use of Indonesian was allowed since the Volksraad sessions held in July 1938. By the time they tried to counter the spread of Malay by teaching Dutch to the natives, it was too late, and in 1942, the Japanese conquered Indonesia and outlawed the use of the Dutch language. Three years later, the Indonesians themselves formally abolished the language and established Bahasa Indonesia as the national language of the new nation. The Pledge was the result of second Youth Pledge held in Batavia in October 1928. On the last pledge, there was an affirmation of Indonesian language as a unifying language throughout the archipelago. The adoption of Indonesian as the country's national language was in contrast to most other post-colonial states, as neither the language with the most native speakers (in this case, Javanese) nor the language of the former European colonial power (in this case, Dutch) was to be adopted, but rather a local language with many fewer native speakers than the most widely spoken local language (nevertheless, Malay was the second most widely spoken language in the colony after Javanese, and had many L2 speakers using it for trade, administration, and education). In 1945 when Indonesia declared its independence, Indonesian was formally declared the national language, although then it was the native language of only about 5 per cent of the population, whereas Javanese and Sundanese were the mother tongues of 42–48 percent and 15 percent respectively. It was a combination of nationalistic, political, and practical concerns that ultimately led to the successful adoption of Indonesian as a national language. In 1945, Javanese was easily the most prominent language in Indonesia. It was the native language of nearly half the population, the primary language of politics and economics, and the language of courtly, religious, and literary tradition. What it lacked, however, was the ability to unite the diverse Indonesian population as a whole. With thousands of islands and hundreds of different languages, the newly independent country of Indonesia had to find a national language that could realistically be spoken by the majority of the population and that would not divide the nation by favoring one ethnic group, namely the Javanese, over the others. In 1945, Indonesian was already in widespread use; in fact, it had been for roughly a thousand years. Over that long period of time, Malay, which would later become standardized as Indonesian, was the primary language of commerce and travel. In addition, it was the language used for the propagation of Islam in the 13th to 17th centuries, as well as the language of instruction used by Portuguese and Dutch missionaries attempting to convert the indigenous people to Christianity. The combination of all of these factors meant that the language was already known to some degree by most of the population, and it could be more easily adopted as the national language than perhaps any other. Moreover, it was the language of the sultanate of Brunei and of the future Malaysia, on which some Indonesian nationalists had claims (see Greater Indonesia). Over the first 53 years of Indonesian independence, the country's first two presidents, Sukarno and Suharto constantly nurtured the sense of national unity embodied by Indonesian, and the language remains an important component of Indonesian identity today. Through a language planning program that made Indonesian the language of politics, education, and nation-building in general, Indonesia became one of the few success stories of an indigenous language effectively overtaking that of a country's colonizers to become the de jure and de facto official language. It is a unique and somewhat unusual story, especially considering the historical dominance of Javanese; a diverse collection of peoples were able to compromise to hold the nation together. Today, Indonesian continues to function as the language of national identity as the Congress of Indonesian Youth envisioned, and it also serves as the language of education, literacy, modernization, and social mobility. Despite still being a second language to most Indonesian citizens, it is unquestionably the language of the Indonesian nation as a whole, as it has had unrivaled success as a factor in nation-building and the strengthening of Indonesian identity. While Indonesian is spoken as a mother tongue by only a small proportion of Indonesia's large population (i.e. mainly those who reside within the vicinity of Jakarta and other large predominantly Indonesian-speaking cities such as Medan and Balikpapan), over 200 million people regularly make use of the national language, with varying degrees of proficiency. In a nation that boasts more than 700 native languages and a vast array of ethnic groups, it plays an important unifying and cross-archipelagic role for the country. Use of the national language is abundant in the media, government bodies, schools, universities, workplaces, among members of the Indonesian upper-class or nobility and also in many other formal situations, although the 2010 Indonesian Census shows that only 19.94% of people over 5 years old speak mainly Indonesian at home. Standard and formal Indonesian is used in books and newspapers and on television/radio news broadcasts; however, few native Indonesian speakers use the formal language in their daily conversations. While this is a phenomenon common to most languages in the world (for example, spoken English does not always correspond to its written standards), the proximity of spoken Indonesian (in terms of grammar and vocabulary) to its normative form is noticeably low. This is mostly due to Indonesians combining aspects of their own local languages (e.g., Javanese, Sundanese, Balinese, and Chinese) with Indonesian. This results in various vernacular varieties of Indonesian, the very types that a foreigner is most likely to hear upon arriving in any Indonesian city or town. This phenomenon is amplified by the use of Indonesian slang, particularly in the cities. The most common and widely used colloquial Indonesian is heavily influenced by the Betawi language, a Malay-based creole of Jakarta, amplified by its popularity in Indonesian popular culture in mass media and Jakarta's status as the national capital. In informal spoken Indonesian, various words are replaced with those of a less formal nature. For example, tidak (no) is often replaced with the Betawi form nggak or the even simpler gak, while seperti (like, similar to) is often replaced with kayak [kajaʔ]. Sangat or amat (very), the term to express intensity, is often being replaced with the Javanese-influenced banget. As for pronunciation, the diphthongs ai and au on the end of base words are typically pronounced as /e/ and /o/. In informal writing the spelling of words is modified to reflect the actual pronunciation in a way that can be produced with less effort. For example, capai becomes cape or capek, pakai becomes pake, kalau becomes kalo. In verbs, the prefix me- is often dropped, although an initial nasal consonant is often retained, as when mengangkat becomes ngangkat (the basic word is angkat). The suffixes -kan and -i are often replaced by -in. For example, mencarikan becomes nyariin, menuruti becomes nurutin. The latter grammatical aspect is one often closely related to the Indonesian spoken in Jakarta and its surrounding areas. Indonesian is one of the many varieties of Malay. Malay historical linguists agree on the likelihood of the Malay homeland being in western Borneo stretching to the Bruneian coast. A form known as Proto-Malay language was spoken in Borneo at least by 1000 BCE and was, it has been argued, the ancestral language of all subsequent Malayan languages. Its ancestor, Proto-Malayo-Polynesian, a descendant of the Proto-Austronesian language, began to break up by at least 2000 BCE, possibly as a result of the southward expansion of Austronesian peoples into Maritime Southeast Asia from the island of Taiwan. Indonesian, which originated from Malay, is a member of the Austronesian family of languages, which includes languages from Southeast Asia and the Pacific Ocean, with a smaller number in continental Asia. Malagasy, a geographic outlier spoken in Madagascar in the Indian Ocean; the Philippines national language, Filipino; and the native language of New Zealanders, Māori language are also members of this language family. Although each language of the family is mutually unintelligible, their similarities are rather striking. Many roots have come virtually unchanged from their common ancestor, Proto-Austronesian language. There are many cognates found in the languages' words for kinship, health, body parts and common animals. Numbers, especially, show remarkable similarities. However, Indonesian as it is known today was heavily influenced by several languages due to historical ties with other nations. Dutch made the highest contribution to the language, especially in vocabulary due to the Dutch's colonization for over three centuries, from the 16th century until the mid-20th century. Asian languages also influenced the language, with Chinese influencing Indonesian during the 15th and 16th centuries due to the spice trade; Sanskrit, Tamil, Prakrit and Hindi contributing during the flourishing of Hindu and Buddhist kingdoms from the 2nd to the 14th century; followed by Arabic after the spread of Islam in the archipelago in the 13th century. Loanwords from Portuguese were mainly connected with articles that the early European traders and explorers brought to Southeast Asia. Indonesian also receives many of English words as results of globalization and modernization, especially since the 1990s, as far as the Internet's emergence and development until now. Some Indonesian words have also been borrowed into English, among them the common words orangutan, gong, bamboo, rattan, sarong, and the less common words such as paddy, sago and kapok. The phrase "to run amok" comes from the Indonesian verb amuk (to run out of control, to rage). Indonesian is neither pidgin nor creole since the feature characteristics do not meet any of the criteria for either. 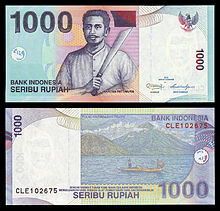 It is believed that the Indonesian language was one of the means to achieve independence, but it is opened to receive vocabulary from other foreign languages aside from Malay that it has made contact with since the colonialism era, such as Dutch, English and Arabic among others, as the loan words keep increasing each year. In 2010, Indonesian had 42.8 million native speakers, and 154.9 million second-language speakers, who speak it alongside their local mother tongue, giving a total number of speakers in Indonesia of 197.7 million. It is common as a first language in urban areas, and as a second language by those residing in more rural parts of Indonesia. The VOA and BBC use Indonesian as their standard for broadcasting in Malay. In Australia, Indonesian is one of three Asian target languages, together with Japanese and Mandarin, taught in some schools as part of the Languages Other Than English programme. Indonesian has been taught in Australian schools and universities since the 1950s. In East Timor, which was occupied by Indonesia between 1975 and 1999, Indonesian is recognised by the constitution as one of the two working languages (the other being English), alongside the official languages of Tetum and Portuguese. It is understood by the Malay people of Australia's Cocos Keeling Islands in the Indian Ocean, also in some parts of the Sulu area of the southern Philippines and traces of it are to be found among people of Malay descent in Sri Lanka, South Africa, Suriname, and other places. Indonesian is also the language of Indonesian mass media, such as magazines. Printed and broadcast mass media are encouraged to use proper Indonesian, although more relaxed popular slang often prevails. Indonesian is the official language of Indonesia, thus its usage is encouraged throughout the Indonesian archipelago. It is regulated in Chapter XV, 1945 Constitution of Indonesia about the flag, official language, coat of arms, and national anthem of Indonesia. Also in Chapter III, Section 25 to 45, Government regulation No. 24/ 2009 specifically mentions the status of the Indonesian language. The national language shall be Indonesian. Indonesian functions as a symbol of national identity and pride, and is a unifying language among the diverse Indonesian ethnic groups. It also serves as a vehicle of communication among the Indonesian provinces and different regional cultures in Indonesia. The language is used as the national official language, the language of education, communication, transaction and trade documentation, the development of national culture, science, technology, and mass media in Indonesia. According to Indonesian law, the Indonesian language was proclaimed as the unifying language during Sumpah Pemuda on 28 October 1928, developed further to accommodate the dynamics of Indonesian civilization. As mentioned previously, the language was based on Riau Malay, though linguists note that this is not the local dialect of Riau, but the Malaccan dialect that was used in the Riau court. Since its conception in 1928 and its official recognition in 1945 Constitution, the Indonesian language has been loaded with a nationalist political agenda to unify Indonesia (former Dutch East Indies). This status has made the Indonesian language relatively open to accommodate influences from other Indonesian ethnic languages, most notably Javanese as the majority ethnic group in Indonesia, and Dutch as the previous colonizer. Compared to the indigenous dialects of Malay spoken in Sumatra and Malay peninsula or the normative Malaysian standard, the Indonesian language differs profoundly by a large amount of Javanese loanwords incorporated into its already rich vocabulary. As a result, Indonesian has wider sources of loanwords, compared to Malaysian Malay. It is sometimes said that the Indonesian language is an artificial language made official in 1928. By artificial, it means that Indonesian was designed by academics rather than evolving naturally as most common languages have, in order to accommodate the political purpose of establishing an official unifying language of Indonesia. By borrowing heavily from numerous other languages it expresses a natural linguistic evolution; in fact, it is as natural as the next language, as demonstrated in its exceptional capacity for absorbing foreign vocabulary. The disparate evolution of Indonesian and Malaysian has led to a rift between the two standardized registers. This has been based more upon political nuance and the history of their standardization rather than cultural reasons, and as a result there are asymmetrical views regarding each other's variety among Malaysians and Indonesians. In Malaysia, the national language is called either Malay or Malaysian; in Indonesia, it is Indonesian. Malaysians tend to assert that Malaysian and Indonesian are merely different normative varieties of the same language, while Indonesians tend to treat them as separate, albeit closely related, languages. The result of this attitude is that Indonesians feel little need to harmonize their language with Malaysia and Brunei, whereas Malaysians are keener to coordinate the evolution of the language with Indonesians, although the 1972 Indonesian alphabet reform was largely seen as a concession of Dutch-based Indonesian to the English-based spelling of Malaysian. It is usually said that there are six vowels in Indonesian. These six vowels are shown in the table below. However, other analyses set up a system with other vowels, particularly the open-mid vowels /ɛ/ and /ɔ/. In standard Indonesian orthography, the Latin alphabet is used, and five vowels are distinguished: a, i, u, e, o. In materials for learners, the mid-front vowel /e/ is sometimes represented with a diacritic as é to distinguish it from the mid-central vowel /ə/. Others assume that these diphthongs are actually a monophthong followed by an approximant, so ⟨ai⟩ represents /aj/, ⟨au⟩ represents /aw/, and ⟨oi⟩ represents /oj/. On this basis, there are no phonological diphthongs in Indonesian. The consonants of Indonesian are shown below. Non-native consonants that only occur in borrowed words, principally from Arabic and English, are shown in parentheses. Some analyses list 19 "primary consonants" for Indonesian as the 18 symbols that are not in parentheses in the table as well as the glottal stop [ʔ]. The secondary consonants /f/, /v/, /z/, /ʃ/ and /x/ only appear in loanwords. Some speakers pronounce /v/ in loanwords as [v], otherwise it is [f]. Likewise /x/ may be replaced with [h] or [k] by some speakers. /ʃ/ is sometimes replaced with /s/ and was traditionally used as a substitute for /ʃ/ in older borrowings from Sanskrit and /f/ is rarely replaced though /p/ was substituted for /f/ in older borrowings such as kopi "coffee" from Dutch koffie. /z/ may occasionally be replaced with /s/ or /d͡ʒ/. [z] can also be an allophone of /s/ before voiced consonants. Indonesian has light stress that falls on either the final or penultimate syllable, depending on regional variations as well as the presence of the schwa (/ə/) in a word. It is generally the penultimate syllable that is stressed, unless its vowel is a schwa /ə/. If the penult has a schwa, then stress moves to the ante-penultimate syllable if there is one, even if that syllable has a schwa as well; if the word is disyllabic, the stress is final. In disyllabic stress with a closed penultimate syllable, such as tinggal ('stay') and rantai ('chain'), stress falls on the penult. However, there is some disagreement among linguists over whether stress is phonemic (unpredictable), with some analyses suggesting that there is no underlying stress in Indonesian. The classification of languages based on rhythm can be problematic. Nevertheless, acoustic measurements suggest that Indonesian has more syllable-based rhythm than British English, even though doubts remain about whether the syllable is the appropriate unit for the study of Malay prosody. However, many linguists suggest that rhythm in Indonesian is not payed[clarification needed], because Indonesian is not a kind of tonal language like Chinese, Thai, or Vietnamese. Word order in Indonesian is generally subject-verb-object (SVO), similar to that of most modern European languages, such as English. However considerable flexibility in word ordering exists, in contrast with languages such as Japanese or Korean, for instance, which always end clauses with verbs. Indonesian, while allowing for relatively flexible word orderings, does not mark for grammatical case, nor does it make use of grammatical gender. In Indonesian, affixes take on an important role because slightly different affixes may have very different meanings. There are four types of affixes: prefixes (awalan), suffixes (akhiran), circumfixes (apitan) and infixes (sisipan). Affixes are categorized into noun, verb, and adjective affixes. Root words are either nouns or verbs, which can take on affixes to generate new words, for example, masak (to cook) may become memasak (cooks), memasakkan (cooks for), dimasak (is cooked), pemasak (a cook), masakan (a meal, cookery), ‘’termasak’’ (accidentally cooked). Many initial consonants alternate in the presence of prefixes: sapu (to sweep) becomes menyapu (sweeps/sweeping); panggil (to call) becomes memanggil (calls/calling), tapis (to sieve) becomes menapis (sieves). terpelajar = well-educated, literally "been taught"
berpelajaran = is educated, literally "has education"
The prefix per- drops its r before r, l and frequently before p, t, k. In some words it is peng-; though formally distinct, these are treated as variants of the same prefix in Indonesian grammar books. In addition to these affixes, Indonesian also has a lot of borrowed affixes from other languages such as Sanskrit, Arabic and English. For example, maha-, pasca-, eka-, bi-, anti-, pro- etc. Common derivational affixes for nouns are peng-/per-/juru- (actor, instrument, or someone characterized by the root), -an (collectivity, similarity, object, place, instrument), ke-...-an (abstractions and qualities, collectivities), per-/peng-...-an (abstraction, place, goal or result). Indonesian does not make use of grammatical gender, and there are only selected words that use natural gender. For instance, the same word is used for he/him and she/her (dia or ia) or for his and her (dia, ia or -nya). No real distinction is made between "girlfriend" and "boyfriend", both pacar (although more colloquial terms as cewek girl/girlfriend and cowok boy/boyfriend can also be found). A majority of Indonesian words that refer to people generally have a form that does not distinguish between the sexes. However, unlike English, distinction is made between older or younger. There are some words that have gender, for instance putri means "daughter", and putra means "son" and also pramugara means "male flight attendant" and pramugari meaning "female flight attendant". Another example would be olahragawan, which equates to "sportsman", and olahragawati, meaning sportswoman. Often, words like these (or certain suffixes such as "-a" and "-i" or "-wan" and "wati") are absorbed from other languages (in these cases, from Sanskrit through the Old Javanese language). In some regions of Indonesia such as Sumatra and Jakarta, abang (a gender-specific term meaning "older brother") is commonly used as a form of address for older siblings/males, while kakak (a non-gender specific term meaning "older sibling") is often used to mean "older sister". Similarly, more direct influences from other languages, such as Javanese and Chinese, have also seen further use of other gendered words in Indonesian. For example: Mas ("older brother"), M'bak ("older sister"), Koko ("older brother") and Cici ("older sister"). Indonesian grammar does not regularly mark plurals. In Indonesian, to change a singular into a plural one either repeats the word or adds para before it (the latter for living things only); for example, "students" can be either murid-murid or para murid. Plurals are rarely used in Indonesian, especially in informal parlance. Reduplication is often mentioned as the formal way to express the plural form of nouns in Indonesian; however, in informal daily discourse, speakers of Indonesian usually use other methods to indicate the concept of something being "more than one". Reduplication may also indicate the conditions of variety and diversity as well, and not simply plurality. Reduplication is commonly used to emphasize plurality; however, reduplication has many other functions. For example, orang-orang means "(all the) people", but orang-orangan means "scarecrow". Similarly, while hati means "heart" or "liver", hati-hati is a verb meaning "to be careful". Also, not all reduplicated words are inherently plural, such as orang-orangan "scarecrow/scarecrows", biri-biri "a/some sheep" and kupu-kupu "butterfly/butterflies". Some reduplication is rhyming rather than exact, as in sayur-mayur "(all sorts of) vegetables". Distributive affixes derive mass nouns that are effectively plural: pohon "tree", pepohonan "flora, trees"; rumah "house", perumahan "housing, houses"; gunung "mountain", pegunungan "mountain range, mountains". Quantity words come before the noun: seribu orang "a thousand people", beberapa pegunungan "a series of mountain ranges", beberapa kupu-kupu "some butterflies". Plural in Indonesian serves just to explicitly mention the number of objects in sentence. For example, Ani membeli satu kilo mangga (Ani buys one kilogram of mangoes). In this case, "mangoes", which is plural, is not said as mangga-mangga because the plurality is implicit: the amount a kilogram means more than one mango. So, as it is logically, one does not change the singular into the plural form, because it is not necessary and considered a pleonasm (in Indonesian often called pemborosan kata). Personal pronouns are not a separate part of speech, but a subset of nouns. They are frequently omitted, and there are numerous ways to say "you". Commonly the person's name, title, title with name, or occupation is used ("does Johnny want to go? ", "would Madam like to go? "); kin terms, including fictive kinship, are extremely common. However, there are also dedicated personal pronouns, as well as the demonstrative pronouns ini "this, the" and itu "that, the". From the perspective of a European language, Indonesian boasts a wide range of different pronouns, especially to refer to the addressee (the so-called second person pronouns). These are used to differentiate several parameters of the person they are referred to, such as the social rank and the relationship between the addressee and the speaker. Notable among the personal-pronoun system is a distinction between two forms of "we": kita (you and me, you and us) and kami (us, but not you). The distinction is increasingly confused in colloquial Indonesian. Saya and aku are the two major forms of "I". Saya is the more formal form, whereas aku is used with family, friends, and between lovers. Sahaya is an old or literary form of saya. Sa(ha)ya may also be used for "we", but in such cases it is usually used with sekalian or semua "all"; this form is ambiguous as to whether it corresponds with inclusive kami or exclusive kita. Less common are hamba "slave", hamba tuan, hamba datuk (all extremely humble), beta (a royal addressing oneselves), patik (a commoner addressing a royal), kami (royal or editorial "we"), kita, təman, and kawan. There are three common forms of "you", Anda (polite), kamu (familiar), and kalian "all" (commonly used as a plural form of you, slightly informal). Anda is used with strangers, recent acquaintances, in advertisements, in business, and when you wish to show respect (though terms like tuan "sir" and other titles also show respect), while kamu is used in situations where the speaker would use aku for "I". Anda sekalian is polite plural. Engkau (əngkau), commonly shortened to kau, and hang are used to social inferiors, awak to equals, and əncik (cek before a name) is polite, traditionally used for people without title. The compounds makcik and pakcik are used with village elders one is well acquainted with or the guest of. The common word for "s/he" and "they" is ia, which has the object and emphatic/focused form dia. Bəliau "his/her Honour" is respectful. As with "you", names and kin terms are extremely common. Mereka "someone", mereka itu, or orang itu "those people" are used for "they". There are a large number of other words for "I" and "you", many regional, dialectical, or borrowed from local languages. Saudara "you" (male) and saudari (female) (plural saudara-saudara or saudari-saudari) show utmost respect. Daku "I" and dikau "you" are poetic or romantic. Indonesian gua "I" (from Hokkien Chinese: 我; Pe̍h-ōe-jī: góa) and lu "you" (Chinese: 汝; Pe̍h-ōe-jī: lú) are slang and extremely informal. The pronouns aku, kamu, engkau, ia, kami, and kita are indigenous to Indonesian. Aku, kamu, engkau, and ia have short possessive enclitic forms. All others retain their full forms like other nouns, as does emphatic dia: meja saya, meja kita, meja anda, meja dia "my table, our table, your table, his/her table". Possessed forms of meja "table"
Ku-dengar raja itu menderita penyakit kulit. Aku mengetahui ilmu kedokteran. Aku-lah yang akan mengobati dia. "It has come to my attention that the King has a skin disease. I am skilled in medicine. I will cure him." Here ku-verb is used for a general report, aku verb is used for a factual statement, and emphatic aku-lah meng-verb (≈ "I am the one who...") for focus on the pronoun. There are two demonstrative pronouns in Indonesian. Ini "this, these" is used for a noun which is generally near to the speaker. Itu "that, those" is used for a noun which is generally far from the speaker. Either may sometimes be equivalent to English "the". There is no difference between singular and plural. However, plural can be indicated through duplication of a noun followed by a ini or itu. The word yang "which" is often placed before demonstrative pronouns to give emphasis and a sense of certainty, particularly when making references or enquiries about something/ someone, like English "this one" or "that one". Yang ini Q: Anda mau membeli buku yang mana? A: Saya mau yang ini. Q: Which book do you wish to purchase? A: I would like this one. Yang itu Q: Kucing mana yang memakan tikusmu? Q: Which cat ate your mouse? Verbs are not inflected for person or number, and they are not marked for tense; tense is instead denoted by time adverbs (such as "yesterday") or by other tense indicators, such as sudah "already" and belum "not yet". On the other hand, there is a complex system of verb affixes to render nuances of meaning and to denote voice or intentional and accidental moods. Some of these affixes are ignored in colloquial speech. Examples of these are the prefixes di- (patient focus, traditionally called "passive voice", with OVA word order in the third person, and OAV in the first or second persons), meng- (agent focus, traditionally called "active voice", with AVO word order), memper- and diper- (causative, agent and patient focus), ber- (stative or habitual; intransitive VS order), and ter- (agentless actions, such as those which are involuntary, sudden, stative or accidental, for VA = VO order); the suffixes -kan (causative or benefactive) and -i (locative, repetitive, or exhaustive); and the circumfixes ber-...-an (plural subject, diffuse action) and ke-...-an (unintentional or potential action or state). Forms in ter- and ke-...-an are often equivalent to adjectives in English. Four words are used for negation in Indonesian, namely tidak, bukan, jangan, and belum. Tidak (not), often shortened to tak, is used for the negation of verbs and "adjectives". Bukan (be-not) is used in the negation of a noun. Jangan tinggalkan saya di sini! Jangan! Itu tidak bagus untukmu. Don't! That's not good for you. There are grammatical adjectives in Indonesian. Stative verbs are often used for this purpose as well. Adjectives are always placed after the noun that they modify. Hence, "rumah saya" means "my house", while "saya rumah" means "I am a house". Hutan hijau forest green (The) green forest. Hutan itu hijau forest that green That/the forest is green. Kəreta yang merah carriage which (is) red. (The) carriage which is red = the red carriage. Kəreta merah carriage red. Red carriage. Orang terkenal person famous. Famous person. To say that something "is" an adjective, the determiners "itu" and "ini" ("that" and "this") are often used. For example, in the sentence "anjing itu galak", the use of "itu" gives a meaning of "the/that dog is ferocious", while "anjing ini galak", gives a meaning of "this dog is ferocious". However, if "itu" or "ini" were not to be used, then "anjing galak" would meaning only "ferocious dog", a plain adjective without any stative implications. The all-purpose determiner, "yang", is also often used before adjectives, hence "anjing yang galak" also means "ferocious dog" or more literally "dog which is ferocious"; "yang" will often be used for clarity. Hence, in a sentence such as "saya didekati oleh anjing galak" which means "I was approached by a ferocious dog", the use of the adjective "galak" is not stative at all. Often the "ber-" intransitive verb prefix, or the "ter-" stative prefix is used to express the meaning of "to be...". For example, "beda" means "different", hence "berbeda" means "to be different"; "awan" means "cloud", hence "berawan" means "cloudy". Using the "ter-" prefix, implies a state of being. For example, "buka" means "open", hence "terbuka" means "is opened"; "tutup" means "closed/shut", hence "tertutup" means "is closed/shut". Adjectives, demonstrative determiners, and possessive determiners follow the noun they modify. Indonesian does not have a grammatical subject in the sense that English does. In intransitive clauses, the noun comes before the verb. When there is both an agent and an object, these are separated by the verb (OVA or AVO), with the difference encoded in the voice of the verb. OVA, commonly but inaccurately called "passive", is the basic and most common word order. Bisa dibantu? Can + to be helped? Can (I) help (you)? Ultimately, the choice of voice and therefore word order is a choice between actor and patient and depends quite heavily on the language style and context. Saya pergi ke pasar kemarin "I went to the market yesterday" – neutral, or with focus on the subject. Kemarin saya pergi ke pasar "Yesterday I went to the market" – emphasis on yesterday. Ke pasar saya pergi, kemarin "To the market I went yesterday" – emphasis on where I went yesterday. Pergi ke pasar, saya, kemarin "To the market went I yesterday" – emphasis on the process of going to the market. The last two are more likely to be encountered in speech than in writing. Another distinguishing feature of Indonesian is its use of measure words, also called classifiers (kata penggolong). In this way, it is similar to many other languages of Asia, including Chinese, Japanese, Vietnamese, Thai, Burmese, and Bengali. "There was a (certain) bird that could talk"
Indonesian is written with the Latin script. It was originally based on the Dutch spelling and still bears some similarities to it. Consonants are represented in a way similar to Italian, although ⟨c⟩ is always /tʃ/ (like English ⟨ch⟩), ⟨g⟩ is always /ɡ/ ("hard") and ⟨j⟩ represents /dʒ/ as it does in English. In addition, ⟨ny⟩ represents the palatal nasal /ɲ/, ⟨ng⟩ is used for the velar nasal /ŋ/ (which can occur word-initially), ⟨sy⟩ for /ʃ/ (English ⟨sh⟩) and ⟨kh⟩ for the voiceless velar fricative /x/. Both /e/ and /ə/ are represented with ⟨e⟩. Introduced in 1901, the van Ophuijsen system, (named from the advisor of the system, Charles Adriaan van Ophuijsen) was the first standardization of romanized spelling. It was most influenced by the then current Dutch spelling system. In 1947, the spelling was changed into Republican Spelling or Soewandi Spelling (named by at the time Minister of Education, Soewandi). This spelling changed formerly spelled oe into u (however, the spelling influenced other aspects in orthography, for example writing reduplicated words). All of the other changes were a part of the Perfected Spelling System, an officially mandated spelling reform in 1972. Some of the old spellings (which were derived from Dutch orthography) do survive in proper names; for example, the name of a former president of Indonesia is still sometimes written Soeharto, and the central Java city of Yogyakarta is sometimes written Jogjakarta. The Indonesian alphabet is exactly the same as in ISO basic Latin alphabet. Indonesian follows the letter names of the Dutch alphabet. Indonesian alphabet has a phonemic orthography; words are spelled the way they are pronounced, with few exceptions. The letters Q, V and X are rarely encountered, being chiefly used for writing loanwords. A pie chart showing percentage of other languages contribute on loan words of Indonesian language. As a modern variety of Malay, Indonesian has been influenced by other languages, including Dutch, English, Arabic, Chinese, Portuguese, Sanskrit, Tamil, Hindi, and Persian. It is estimated that there are some 750 Sanskrit loanwords in modern Indonesian, 1,000 Arabic loans, some of Persian and Hebrew origin, some 125 words of Portuguese, some of Spanish and Italian origin, and 10,000 loanwords from Dutch. [full citation needed] The vast majority of Indonesian words, however, come from the root lexical stock of Austronesian (including Old Malay). The study of Indonesian etymology and loan words reveals both its historical and social contexts. Examples are the early Sanskrit borrowings from the 7th century during the trading era, the borrowings from Arabic and Persian during the time of the establishment of Islam in particular, and those from Dutch during the colonial period. Linguistic history and cultural history are clearly linked. Note: This list only lists foreign languages, and thus omitting numerous local languages of Indonesia that have also been major lexical donors, such as Javanese, Sundanese, Betawi, etc. For a more complete list of these, see List of loanwords in Indonesian. National emblem of Indonesia, Indonesian National Police, Indonesian Air Force and Indonesian Army mottos are Bhinneka Tunggal Ika, Rastra Sewakottama, Swa Bhuwana Paksa, Kartika Eka Paksi, all in Sanskrit language. The Sanskrit influence came from contacts with India since ancient times. The words were either borrowed directly from India or with the intermediary of the Old Javanese language. Although Hinduism and Buddhism are no longer the major religions of Indonesia, Sanskrit, which was the language vehicle for these religions, is still held in high esteem and is comparable with the status of Latin in English and other Western European languages. Sanskrit is also the main source for neologisms, these are usually formed from Sanskrit roots. The loanwords from Sanskrit cover many aspects of religion, art and everyday life. From Sanskrit came such words as स्वर्ग surga (heaven), भाषा bahasa (language), काच kaca (glass, mirror), राज- raja (king), मनुष्य manusia (mankind), चिन्ता cinta (love), भूमि bumi (earth), भुवन buana (world), आगम agama (religion), स्त्री Istri (wife/woman), जय Jaya (victory/victorious), पुर Pura (city/temple/place) राक्षस Raksasa (giant/monster), धर्म Dharma (rule/regulations), मन्त्र Mantra (words/poet/spiritual prayers), क्षत्रिय Satria (warrior/brave/soldier), विजय Wijaya (greatly victorious/great victory), etc. Sanskrit words and sentences are also used in names, titles, and mottos of the Indonesian National Police and Indonesian Armed Forces such as: Bhayangkara, Laksamana, Jatayu, Garuda, Dharmakerta Marga Reksyaka, Jalesveva Jayamahe, Kartika Eka Paksi, Swa Bhuwana Paksa, Rastra Sewakottama, Yudha Siaga, etc. Because Sanskrit has long been known in the Indonesian archipelago, Sanskrit loanwords, unlike those from other languages, have entered the basic vocabulary of Indonesian to such an extent that, for many, they are no longer perceived to be foreign. Therefore, one could write a short story using only Sanskrit words. The short story below consists of approximately 80 words in Indonesian that are written using Sanskrit words alone, except for a few particles. Karena semua dibiayai dana negara jutaan rupiah, sang mahaguru sastra bahasa Kawi dan mahasiswa-mahasiswinya, duta-duta negeri mitra, Menteri Kebudayaan dan Pariwisata suami-istri, beserta karyawan-karyawati lembaga nirlaba segera berdharmawisata ke pedesaan di utara kota kabupaten Probolinggo antara candi-candi purba, berwahana keledai di kala senja dan bersama kepala desa menyaksikan para tani yang berjiwa bersahaja serta berbudi nirmala secara berbahagia berupacara, seraya merdu menyuarakan gita-gita mantra, yang merupakan sarana pujian mereka memuja nama suci Pertiwi, Dewi Bumi yang bersedia menganugerahi mereka karunia dan restu, meraksa dari bahaya, mala petaka dan bencana. The relationship with China has been going since the 7th century when Chinese merchants traded in some areas of the archipelago such as Riau, West Borneo, East Kalimantan, and North Maluku. At the kingdom of Srivijaya appeared and flourished, China opened diplomatic relations with the kingdom in order to secure trade and seafaring. In 922, Chinese travelers visited Kahuripan in East Java. Since the 11th century, hundreds of thousands of Chinese migrants left Mainland China and settled in many parts of Nusantara (now called as Indonesia). The Chinese loanwords are usually concerned with cuisine, trade or often just things exclusively Chinese. Words of Chinese origin (presented here with accompanying Hokkien/ Mandarin pronunciation derivatives as well as traditional and simplified characters) include pisau (匕首 bǐshǒu – knife), loteng, (樓/層 = lóu/céng – [upper] floor/ level), mie (麵 > 面 Hokkien mī – noodles), lumpia (潤餅 (Hokkien = lūn-piáⁿ) – springroll), cawan (茶碗 cháwǎn – teacup), teko (茶壺 > 茶壶 = cháhú [Mandarin], teh-ko [Hokkien] = teapot), 苦力 kuli = 苦 khu (hard) and 力 li (energy) and even the widely used slang terms gua and lu (from the Hokkien 'goa' 我 and 'lu/li' 汝 – meaning 'I/ me' and 'you'). The word masjid (mosque) in Indonesian derived from Arabic word masjid (مسجد‎). Many Arabic words were brought and spread by merchants from Arab Peninsula like Arabian, Persian, and from the western part of India, Gujarat where many Muslims lived. As a result, many Indonesian words come from the Arabic language. Especially since the late 12th century, Old Malay was heavily influenced by the language and produced many great literary works such as Syair, Babad, Hikayat, and Suluk. This century is known as The Golden Age of Indonesian Literature. Many loanwords from Arabic are mainly concerned with religion, in particular with Islam, and by extension, with greetings such as the word, "selamat" (from Arabic: سلامة‎ salāma = health, soundness) means "safe" or "lucky". Words of Arabic origin include dunia (from Arabic: دنيا‎ dunyā = the present world), names of days (except Minggu), such as Sabtu (from Arabic: سبت‎ sabt-u = Saturday), iklan (آعلان‎ iʻlan = advertisement), kabar (خبر‎ khabar = news), Kursi (كرسي‎ kursī = a chair), jumat (جمعة‎ jumʻa = Friday), ijazah (إجازة‎ ijāza = 'permission', certificate of authority, e.g. a school diploma certificate), kitab (كتاب‎ kitāb = book), tertib (ترتيب‎ tartīb = order/arrangement) and kamus (قاموس‎ qāmūs = dictionary). Allah (Arabic: الله‎), as it is mostly the case for Arabic speakers, is the word for God even in Christian Bible translations. Many early Bible translators, when they came across some unusual Hebrew words or proper names, used the Arabic cognates. In the newer translations this practice is discontinued. They now turn to Greek names or use the original Hebrew Word. For example, the name Jesus was initially translated as 'Isa (Arabic: عيسى‎), but is now spelt as Yesus. Several ecclesiastical terms derived from Arabic still exist in Indonesian language. Indonesian word for bishop is uskup (from Arabic: أسقف‎ usquf = bishop). This in turn makes the Indonesian term for archbishop uskup agung (literally great bishop), which is combining the Arabic word with an Old Javanese word. The term imam (from Arabic: إمام‎ imām = leader, prayer leader) is used to translate a Catholic priest, beside its more common association with an Islamic prayer leader. Some Protestant denominations refer to their congregation jemaat (from Arabic: جماعة‎ jamāʻa = group, a community). Even the name of the Bible in Indonesian translation is Alkitab (from Arabic: الكتاب‎ al-kitāb = the book), which literally means "the Book". 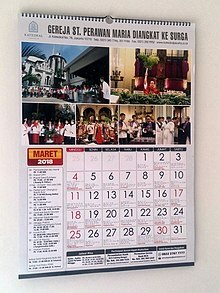 Indonesian word "Gereja" (Church) is derived from Portuguese "Igreja". The sign reads: "Gereja & Candi Hati Kudus Tuhan Yesus Ganjuran Keuskupan Agung Semarang" (The Church and Temple of the Sacred Heart of Jesus Ganjuran Archdiocese of Semarang). Alongside Malay, Portuguese was the lingua franca for trade throughout the archipelago from the sixteenth century through to the early nineteenth century. The Portuguese were among the first westerners to sail eastwards to the "Spice Islands". Loanwords from Portuguese were mainly connected with articles that the early European traders and explorers brought to Southeast Asia. Indonesian words derived from Portuguese include meja (from mesa = table), bangku (from banco = bench), lemari/almari (from armário = closet), boneka (from boneca = doll), jendela (from janela = window), Gereja (from Igreja = Church), Misa (from Missa = Mass), Natal (from Natal = Christmas), Paskah (from Páscoa = Easter), pesta (from festa = party), dansa (from dança = dance), pesiar (from passear = cruise), bendera (from bandeira = flag), sepatu (from sapato = shoes), garpu (from garfo = fork), kemeja (from camisa = shirt), kereta (from carreta = chariot), pompa (from bomba hidráulica = pump), pigura (from figura = picture), roda (from roda = wheel), nona (from dona = young woman), sekolah (from escola = school), lentera (from lanterna = lantern), paderi (from padre = priest), Santo, Santa (from Santo, Santa = Saint), puisi (from poesia = poetry), keju (from queijo = cheese), mentega (from manteiga = butter), serdadu (from soldado = soldier), meski (from mas que = although), kamar (from câmara = room), laguna (from laguna = lagoon), lelang (from leilão = auction), persero (from parceiro = company), markisa (from maracujá = passion fruit), limau (from limão = lemon), kartu (from cartão = card), Inggris (from inglês = English), Sabtu (from sábado = Saturday), Minggu (from domingo = Sunday), etc. Chunghua bioscoop (now bioskop = cinema), Glodok, Jakarta in 1953. The former colonial power, the Netherlands, left a sizable amount of vocabulary that can be seen in words such as polisi (from politie = police), kualitas (from kwaliteit = quality), aktual (from actueel = current), rokok (from roken = smoking cigarettes), korupsi (from corruptie = corruption), kantor (from kantoor = office), resleting (from ritssluiting = zipper), pelopor (from voorloper = frontrunner), persneling (from versnelling = transmission gear), setrum (from stroom = electricity current), maskapai (from maatschappij = company), apotek (from apotheek = pharmacy), handuk (from handdoek = towel), setrika (from strijkijzer = clothes iron), bioskop (from bioscoop = cinema), spanduk (from spandoeken = banner), korsleting (from kortsluiting = short circuit), om (from oom = uncle), tante (from tante = aunt), traktir (from trakteer = treat) and gratis (from gratis = free). These Dutch loanwords, and many other non-Italo-Iberian, European language loanwords that came via Dutch, cover all aspects of life. Some Dutch loanwords, having clusters of several consonants, pose difficulties to speakers of Indonesian. This problem is usually solved by insertion of the schwa. For example, Dutch schroef [ˈsxruf] > sekrup [səˈkrup] (screw (n.)). One scholar argues that 20% of Indonesian words are inspired by the Dutch language. Before the standardization of the language, many Indonesian words follow standard Dutch alphabet and pronunciation such as "oe" for vowel "u" or "dj" for consonant "j" [dʒ]. As a result, Malay words are written with that orthography such as: passer for the word Pasar or djalan for the word jalan, older Indonesian generation tend to have their name written in such order as well. Many English words were incorporated into Indonesian through globalization. Many Indonesians, however, mistake words already adopted from Dutch as words borrowed from English. This is due to the Germanic traces that exist in the two languages. Indonesian adopts English words with standardization. For example: imajinasi from imagination, universitas from university, aksesori from accessory, geografi from geography, konservatif from conservative, rutin from routine, and so other. However, there are several words that directly borrowed without standardization that have same meanings in English such as: bus, data, domain, detail, internet, film, golf, lift, monitor, radio, radar, unit, safari, sonar, and video, riil as real. Modern Indonesian draws many of its words from foreign sources, there are many synonyms. For example, Indonesian has three words for "book", i.e. pustaka (from Sanskrit), kitab (from Arabic) and buku (from Dutch boek); however, each has a slightly different meaning. A pustaka is often connected with ancient wisdom or sometimes with esoteric knowledge. A derived form, perpustakaan means a library. A kitab is usually a religious scripture or a book containing moral guidance. The Indonesian words for the Bible and Gospel are Alkitab and Injil, both directly derived from Arabic. The book containing the penal code is also called the kitab. Buku is the most common word for books. There are direct borrowings from various other languages of the world, such as karaoke (from カラオケ) from Japanese, and ebi (from えび) which means dried shrimp. Many words that originally are adopted through the Dutch language today however often are mistaken as English due to the similarity in the Germanic nature of both languages. In some cases the words are replaced by English language through globalization: although the word arbei (Dutch: aardbei) still literally means strawberry in Indonesian, today the usage of the word stroberi is more common. Greek words such as demokrasi (from δημοκρατία dēmokratía), filosofi (from φιλοσοφία philasophia), mitos (from μῦθος mythos) came through Dutch, Arabic and Portuguese respectively. It is notable that some of the loanwords that exist in both Indonesian and Malaysian languages are different in spelling and pronunciation mainly due to how they derived their origins: Malaysian utilizes words that reflect the English usage (as used by its former colonial power, the British), while Indonesian uses a Latinate form reflected in the Dutch usage (e.g. aktiviti (Malaysian) vs. aktivitas (Indonesian), universiti (Malaysian) vs. universitas (Indonesian)). Indonesia hosts a variety of traditional verbal arts such as poetry, historical narratives, romances, and drama; which are expressed in local languages, but modern genres are expressed mainly through Indonesian. Some of Indonesian great classic stories including Sitti Nurbaya by Marah Rusli, Azab dan Sengsara by Merari Siregar, and Sengsara Membawa Nikmat by Tulis Sutan Sati. Modern literature like novels, short stories, stage plays, and free-form poetry has developed since the late years of the 19th century and has produced such internationally recognised figures as novelist Pramoedya Ananta Toer, dramatist W.S. Rendra, poet Chairil Anwar, and cinematographer Garin Nugroho. Indonesia's classic novels itself, have their own charm, offering insight into local culture and traditions and the historical background prior to and immediately after the country gained independence. One of the great is Shackles which was written by Armijn Pane in 1940. Originally titled Belenggu and translated into many languages including English and German. 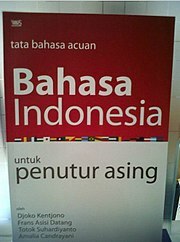 BIPA (Bahasa Indonesia bagi Penutur Asing) book, which helps foreigners to learn the Indonesian language effectively. Over the past few years, interest in learning Indonesian has grown among non-Indonesians. Various universities have started to offer courses that emphasise the teaching of the language to non-Indonesians. In addition to National Universities, private institutions have also started to offer courses, like the Indonesia Australia Language Foundation and the Lembaga Indonesia Amerika. As early as 1988, teachers of the language have expressed the importance of a standardised Bahasa Indonesia bagi Penutur Asing (also called BIPA, literally Indonesian Language for Foreign Speaker) materials (mostly books), and this need became more evident during the 4th International Congress on the Teaching of Indonesian to Speakers of Other Languages held in 2001. Since 2013, the Indonesian Embassy in the Philippines has given basic Indonesian language courses to 16 batches of Filipino students, as well as training to members of the Armed Forces of the Philippines. Due to increasing demand among students, the Embassy will open an intermediate Indonesian language course later in the year. In an interview, Department of Education Secretary Armin Luistro said that the country's government should promote Indonesian or Malay, which are related to Filipino. Thus, the possibility of offering it as an optional subject in public schools is being studied. The Indonesian Embassy in Washington, D.C., USA also began offering free Indonesian language courses at the beginner and intermediate level. The following texts are excerpts from the official translations of the Universal Declaration of Human Rights in Indonesian and Malay, along with the original declaration in English. All human beings are born free and equal in dignity and rights. They are endowed with reason and conscience and should act towards one another in a spirit of brotherhood. Semua orang dilahirkan merdeka dan mempunyai martabat dan hak-hak yang sama. Mereka dikaruniai akal dan hati nurani dan hendaknya bergaul satu sama lain dalam semangat persaudaraan. Semua manusia dilahirkan bebas dan sama rata dari segi maruah dan hak-hak. Mereka mempunyai pemikiran dan perasaan hati dan hendaklah bergaul dengan semangat persaudaraan. ^ a b c d Badan Pusat Statistik (28 March 2013). "Penduduk Indonesia Hasil Sensus Penduduk 2010 (Result of Indonesia Population Census 2010)". pp. 421, 427. ISSN 2302-8513. Archived from the original on 2 April 2015. Retrieved 12 April 2015. ^ a b "East Timor Languages". www.easttimorgovernment.com. ^ Hammarström, Harald; Forkel, Robert; Haspelmath, Martin, eds. (2017). "Indonesian". Glottolog 3.0. Jena, Germany: Max Planck Institute for the Science of Human History. ^ James Neil Sneddon. The Indonesian Language: Its History and Role in Modern Society. UNSW Press, 2004. Page 14." ^ Setiono Sugiharto (28 October 2013). "Indigenous language policy as a national cultural strategy". The Jakarta Post. Retrieved 9 January 2014. ^ Hammam Riza (2008). "Resources Report on Languages of Indonesia" (PDF). Retrieved 9 January 2014. ^ a b "Bahasa dan dialek" (in Indonesian). Republic of Indonesia Embassy in Astana. Archived from the original on 1 May 2013. ^ "Bahasa Melayu Riau dan Bahasa Nasional". Melayu Online. Archived from the original on 22 November 2011. Retrieved 29 March 2012. ^ "Ethnologue: Languages of the World". Ethnologue. ^ "Sriwijaya dalam Tela'ah". Melayu Online. 5 June 2007. Archived from the original on 22 October 2012. Retrieved 1 April 2012. ^ Bambang Budi Utomo (23 January 2008). "Risen Up Maritime Nation!". Melayu Online. Archived from the original on 22 October 2012. Retrieved 1 April 2012. ^ "Bahasa Indonesia: Memasyarakatkan Kembali 'Bahasa Pasar'?". Melayu Online. Archived from the original on 30 June 2012. Retrieved 29 March 2012. ^ a b c d de Swaan, Abram (2001). Words of the World. Cambridge, UK: Polity. pp. 81–95. ISBN 978-0745627489. ^ a b c d Paauw, Scott (2009). "One Land, One Nation, One Language: An Analysis of Indonesia's National Language Policy" (PDF). University of Rochester Working Papers in the Language Sciences. 5 (1): 2–16. Retrieved 18 December 2014. ^ "History of Indonesian Language". Language Translation, Inc. Archived from the original on 4 March 2016. Retrieved 12 January 2016. ^ a b Kratz, U. (2006). "Indonesia * : Language Situation". Indonesia: language situation. Encyclopedia of Language & Linguistics (Second ed.). pp. 639–641. doi:10.1016/B0-08-044854-2/01720-X. ISBN 9780080448541. ^ "Publication Name". Archived from the original on 10 July 2017. Retrieved 4 December 2018. ^ Adelaar, K. Alexander (2004). "Where does Malay come from? Twenty years of discussions about homeland, migrations and classifications". Bijdragen Tot de Taal-, Land- en Volkenkunde. 160 (1): 1–30. doi:10.1163/22134379-90003733. JSTOR 27868100. ^ Munir Hamidy, Badrul (1985). Kamus Lengkap Indonesia-Rejang, Rejang-Indonesia. Pusat Pembinaan dan Pengembangan Bahasa, Departemen Pendidikan dan Kebudayaan. p. xv. ^ "The Indonesian Language (James N Sneddon) – book review". dannyreviews.com. ^ "The Dutch East Indies in photographs, 1860–1940 – Memory of the Netherlands". www.geheugenvannederland.nl. ^ Steinhauer, H. (1980). "On the history of Indonesian". Studies in Slavic and General Linguistics. 1: 349–375. JSTOR 40996873. ^ "Language interference: Indonesian and English". www.macmillandictionaries.com. ^ "Indonesian (Bahasa Indonesia) – About World Languages". aboutworldlanguages.com. ^ "History of Indonesian". ipll.manoa.hawaii.edu. ^ Pratika, D. (2016). "The Existence of Indonesian Language: Pidgin or Creole". Journal on English as a Foreign Language. 6 (2): 83–100. doi:10.23971/jefl.v6i2.397. ^ "Voice of America Bahasa Indonesia". Voice of Indonesia. Retrieved 1 April 2012. ^ "Languages: News and Analysis in your Language". BBC World Service. Retrieved 1 April 2012. ^ Wesley, Michael (10 June 2009). "Building an Asia-literate Australia: an Australian strategy for Asian language proficiency". Australian Policy Online. Retrieved 10 July 2012. ^ a b c "Undang-undang Republik Indonesia Nomor 24 Tahun 2009 2009 Tentang Bendera, Bahasa, dan Lambang Negara, serta Lagu Kebangsaan" (PDF). Badan Pengembangan dan Pembinaan Bahasa, Kementerian Pendidikan dan Kebudayaan. Archived from the original (PDF) on 23 May 2012. Retrieved 1 April 2012. ^ "Indonesian, A language of Indonesia". Ethnologue. Retrieved 10 July 2012. ^ a b "Bahasa Indonesia, The complex story of a simple language". Interesting Thing of the Day. 17 September 2004. Retrieved 1 April 2012. ^ "Who is Malay?". July 2005. Archived from the original on 4 March 2016. ^ a b Soderberg, C. D.; Olson, K. S. (2008). "Indonesian". Journal of the International Phonetic Association. 38 (2): 209–213. doi:10.1017/s0025100308003320. ^ Yunus Maris, M. (1980). The Indonesian Sound System. Kuala Lumpur: Penerbit Fajar Bakti Sdn. Bhd, page 2. ^ Clynes, A (1997). "On the Proto-Austronesian 'diphthongs'". Oceanic Linguistics. 36 (2): 347–362. doi:10.2307/3622989. JSTOR 3622989. ^ a b Clynes, A.; Deterding, D. (2011). "Standard Malay (Brunei)". Journal of the International Phonetic Association. 41 (2): 259–268. doi:10.1017/S002510031100017X. ^ Asmah Haji Omar (2008). Ensiklopedia Bahasa Melayu. Kuala Lumpur: Dewan Bahasa dan Pustaka, page 108. ^ Yunus Maris, M. (1980). The Indonesian Sound System. Kuala Lumpur: Penerbit Fajar Bakti Sdn. Bhd, page 52. ^ a b Mohd Don, Zuraidah; Knowles, G.; Yong, J. (2008). "How words can be misleading: A study of syllable timing and 'stress' in Malay". The Linguistics Journal. 3 (2). ^ Roach, P. (1982). "On the distinction between 'stress-timed' and 'syllable-timed' languages". In D. Crystal (ed. ), Linguistic Controversies (pp. 73–79). London: Edward Arnold. ^ The root ajar retrieves a historic initial l after the suffixes ber- and pe(r)-. ^ "Malay language, alphabets and pronunciation". www.omniglot.com. ^ C. D. Grijns; et al. (eds.). "Loan-words in Indonesian and Malay". ASEASUK, Association of South-East Asian Studies in the United Kingdom. Archived from the original on 12 November 2012. Retrieved 21 July 2012. ^ "Badan Pengembangan dan Pembinaan Bahasa – Kementerian Pendidikan dan Kebudayaan". badanbahasa.kemdikbud.go.id. ^ Ricklefs, M.C. (1991). A History of Modern Indonesia Since c.1300 (2nd ed.). London: MacMillan. p. 26. ISBN 978-0-333-57689-2. ^ Hendrik M. Maier (8 February 2005). "A Hidden Language – Dutch in Indonesia". Institute of European Studies. ^ "Indonesian Literature". Resourceful Indonesian. ^ Watson, C W (2007). "A new introduction to modern Indonesian literature". Indonesia Circle. School of Oriental & African Studies. Newsletter. 10 (29): 33–40. doi:10.1080/03062848208729531. ^ Rahmiasri, Masajeng (20 August 2016). "Must-read Indonesian classic novels". The Jakarta Post. ^ Department Pendidikan Nasiona (2006). Lentera Indonesia 1. Jakarta: Department Pendidikan Nasiona. p. v. ISBN 978-979-685-403-5. ^ "Conference Report: The Fourth International Conference on Teaching Indonesian to Speakers of Other Languages". www.ialf.edu. Archived from the original on 2 April 2015. Retrieved 26 August 2013. ^ Rainier Alain, Ronda (22 March 2013). "Bahasa in schools? DepEd eyes 2nd foreign language". The Philippine Star. Retrieved 11 June 2013. ^ "Indonesian Language Classes". Embassy of the Republic of Indonesia, Washington, DC. Retrieved 30 October 2018. Wikivoyage has a phrasebook for Indonesian. Wikimedia Commons has media related to Indonesian language. How many people speak Indonesian? This page was last edited on 17 April 2019, at 13:50 (UTC).